Women drivers have been getting a bad rap for ages, but this woman driver is a horse of another color; the color green. 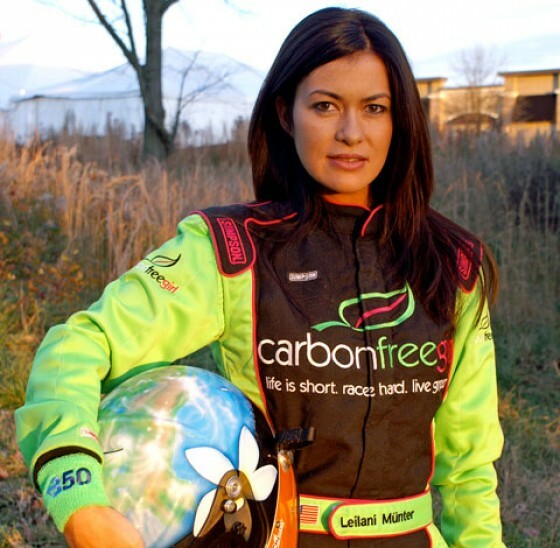 Leilani Münter has the distinction of being only one of 4 female race car drivers to race in the Indy Pro Series. She also set the record for the highest finish for a female driver in the history of the Texas Motor Speedway when she finished 4th in 2006. Take that boys! Leilani is a passionate green activist with the honorable moniker of carbon free girl. Seems hard to be green and clean when you are racing cars over 180 mph, but this animal activist (first ambassador of the National Wildlife Federation), and vegetarian has found a way. Leilani purchases an acre of rainforest for every race she runs to offset her carbon footprint. Fearless on the speedway, she is just as fearless on Capitol Hill having lobbied several times with members of Congress on behalf of clean energy and climate change legislation. She has traveled to Japan to stop the slaughter of dolphins, and was one of the first activists to visit the BP oil spill. She pens a green blog for the Huffington Post and even ousted Lance Armstrong as #1 Eco Athlete by the Discovery Channel. She may be only 105 lbs, but Leilani Münter is no lightweight whether acting as a stunt double, on the race track or tirelessly campaigning for her planet. 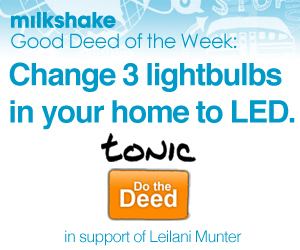 Now she's advocating for LED lighting and you can too by doing today’s milkshake deed. Now go out and change some lightbulbs!